Last week, I thought we were done. 48 players, recapped and published, and I could put my mind at ease. Every one of them was done, and I wouldn’t have to hassle writers to churn out hundreds of words for a player that scarcely needs a word count in the triple digits to describe. Hell, some barely played at all. The sun was shining, the birds were singing, and — oh god, we haven’t done Deven Marrero yet. The 49th man. And now the clouds are coming back and the birds have gone silent. Just one more, I thought to myself. Just one more. Deven Marrero with a glove is silk. He’s one of those players that will make even the toughest of plays seem routine, like he had been preparing his whole life for that one hard-hit grounder to go that far to his right. There’s a subtle pleasure in watching a great fielder do great fielding things, and if that’s your drug, Marrero is your fix. Inject it into our veins. Deven Marrero with a bat? Well, if you can imagine what a disgusted recoil sounds like, that’s pretty much all you need to know. The Red Sox, in their pre-Devers days, had a bit of crisis with finding a third baseman that could actually produce any kind of value. Pablo Sandoval, Josh Rutledge, and Marco Hernandez all tried their best, but due to injuries, ineffectiveness, or a combination of the two, none of them could produce. That’s where Marrero comes in. If their third baseman wasn’t going to get hits, it might as well take them away, and oh boy can Marrero do that. Marrero’s defensive prowess got him 364 innings at third base, along with 106.2 innings at other positions in the infield. That includes 2.2 innings at first base, which he can now field, apparently. It’s only a matter of time until the Red Sox will only require a pitcher, a catcher, and Deven Marrero in the field. We know how horrifying his hitting is, but he did have one bright spot. That’s a two-homer game. Against Jose Quintana. Baseball is simply magical. 188 plate appearances might be good for Marrero on a personal level, but that was a canary in a coal mine for the Red Sox. If someone with Marrero’s offensive prowess was getting that much playing time in the majors, something — more specifically, third base — was very wrong. Marrero slashed .211/.259/.333 with a 32.4 percent strikeout rate, which looks as awful as it is. That comes out to a .215 TAv. He did hit four home runs, which technically counts as a power surge, if you’re looking for the thinnest silver lining possible. Even his time at third base didn’t last very long, all things considered. Tzu-Wei Lin, who was called up directly from Double-A Portland, overtook him at the hot corner in late June. Good thing the Red Sox have Rafael Devers. Marrero is going to be involved in the second base carousel until Dustin Pedroia returns, so he’ll most likely stick with the team for a good while. After that, it’s anyone’s guess. 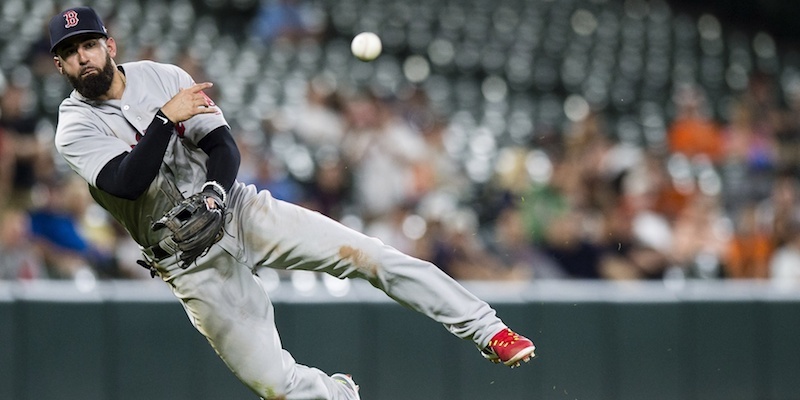 His glove will keep him hovering around the majors, and maybe even start for a team desperate for anything at second base, shortstop, or third base. Right now, he looks to be part of the well-stocked depth the Red Sox have, and with no offense to be found, it isn’t likely that he’ll be much more than that. He’s good for a sparkling defensive play or two, but this is who he is. Just because Pedroia is on the DL doesn’t mean Marrero will “stick with the team for a good while.” I can’t see him making the 25-man by the end of ST, not with Swihart and Holt to contend with and Hanley still occupying a pre-DFA slot.